MEGAMAN® GABIO LED Pendant Louvre series is set to create a new trend for office and commercial task lighting with its understated design. The new series is where minimalist design and advanced optical technology converges. Its suspended task lighting structure is lauded for its subtly-chic beauty, yet equipped with sophisticated optical distribution. With a versatile design, the GABIO LED Pendant Louvre series can be connected with one another into various patterns to meet diverse requirements. An anodized aluminium finishing and high-grade louver, the GABIO series has a low glare rating (UGR≤19) with high level of visual comfort. It can be mounted as recessed, surface-mounted and suspension lighting. 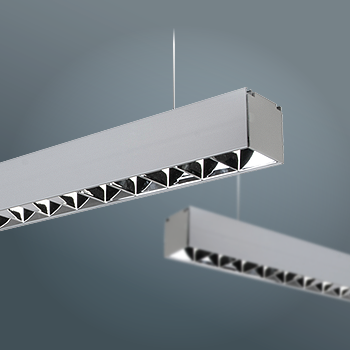 The GABIO LED Pendant Louvre series' wide batwing light distribution and wide beam angle are the features highly sought-after by lighting designers to ensure stable and uniform distribution of light. This fits well into any contemporary interior design for offices, classrooms, hotel reception and other commercial spaces.